Early Literacy Skill: Letter Knowledge–knowing that letters are different from one another and recognizing them makes it easier for kids to read later on! Flannelboard Game: Who took the cookie from the cookie jar? All of the pieces here are clip art, printed onto cardstock. I cut them out, laminated them using clear contact paper, and put a sticky velcro dot on the back. 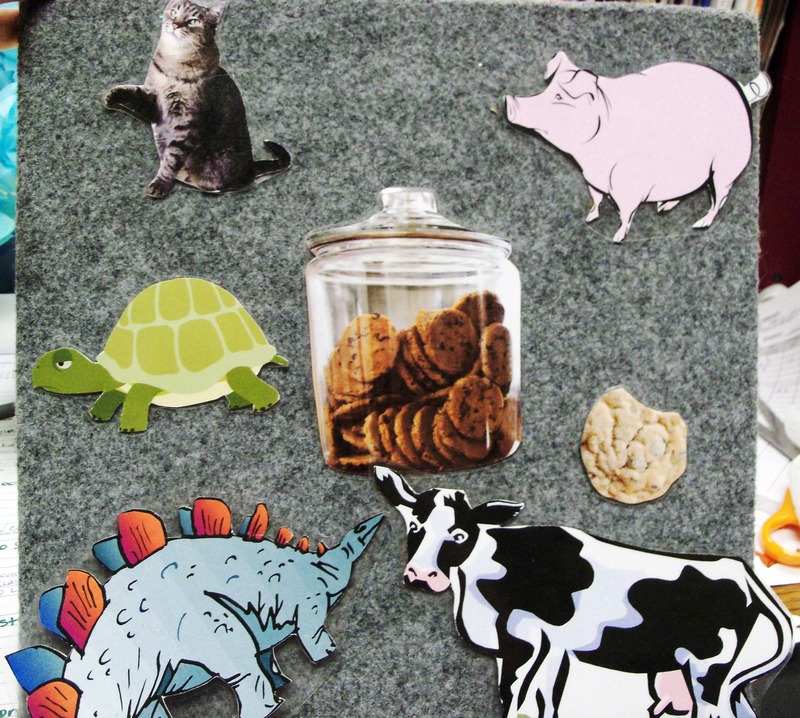 (Note: I didn’t use the cow for this session–only the cat, pig, turtle, and dinosaur. I used the cow instead of the dinosaur at Pre-K, which I’ll blog about tomorrow). I put the cookie behind the dinosaur before starting. Then we sang “Who took the cookie from the cookie jar? Cat took the cookie from the cookie jar! Who, me? Yes, you! Couldn’t be! (take cat off of board) Then who?” We went through like this until we got to the dinosaur, then I showed them the cookie with the bite taken out of it. 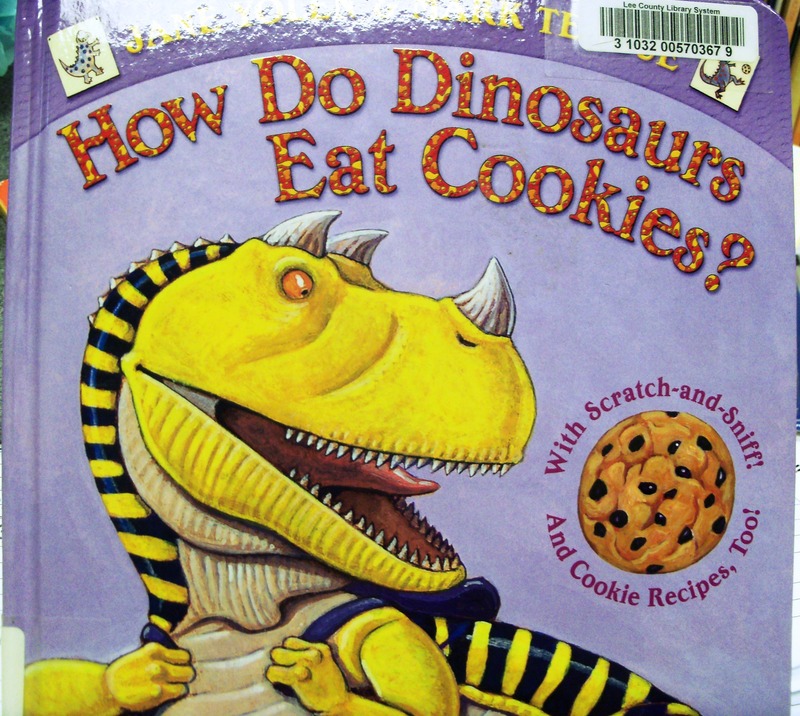 How Do Dinosaurs Eat Cookies? by Jane Yolen, Illustrated by Mark Teague. (BB E YOLE). Flannelboard: I scanned in the images from the book to make a flannelboard of the different kinds of cookies we saw. I also printed out pieces with the words on them to encourage print awareness. We clapped out the syllables for the cookie names. Flannelboard: Five Little Cookies. I’ll post a picture of the flannelboard tomorrow. They are five flannel cookies with glitter sprinkled on top. I used my dinosaur puppet to take the cookies away. We counted the cookies after each time one was taken away. See Mel’s Desk for the rhyme/song. 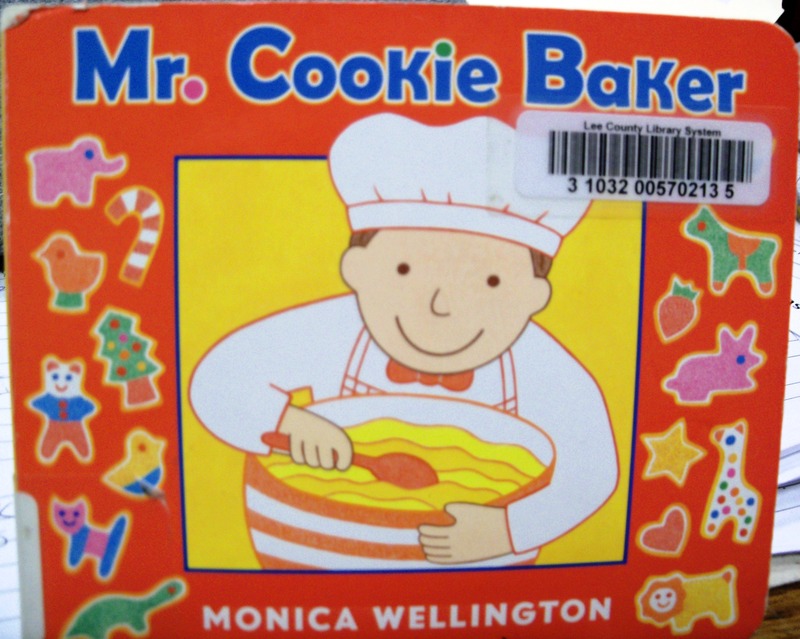 Mr. Cookie Baker, by Monica Wellington. (BB E WELL). 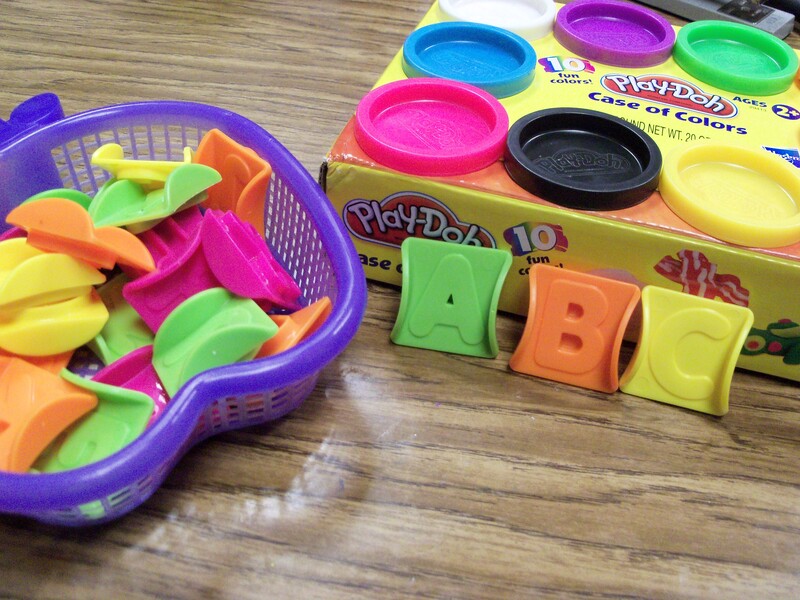 Activity: Play-Doh and alphabet “cookie” cutters. I used a cookie theme for my Pre-K storytime, too, but we read different books and I used the flannelboards differently. I’ll be back tomorrow to share that storytime with you. Now, go have a cookie! 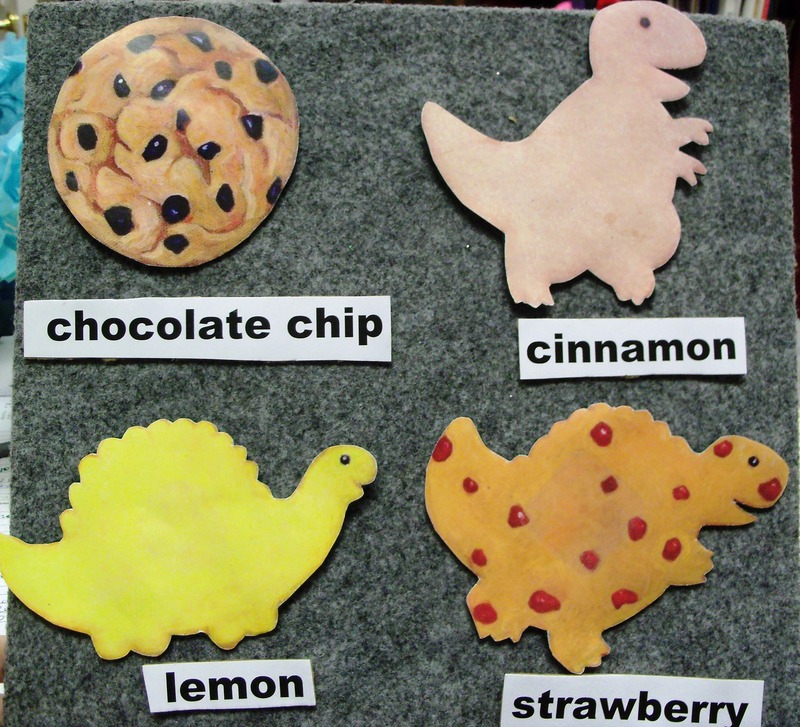 Posted in At the library, Early literacy, Fun with felt, StorytimesTagged cookies, early literacy skills, flannelboard, how do dinosaurs eat cookies?, jane yolen, letter knowledge, mark teague, monica wellington, mr. cookie baker, play-doh, preschool storytime, rhyme cubeBookmark the permalink. Aw, I hope she feels better soon! Hope to see you next week!